A recent reported published by Switzerland’s Federal Department of Defence, Civil Protection and Sport (DDPS), reveals that 42 extremism investigations were requested in 2017. In 2016, there were 50. 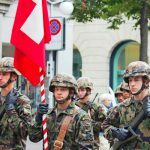 Switzerland has a system of compulsory military service for all Swiss men who pass a physical and psychological aptitude test. Those who miss the mark on the test must pay an additional 3% income tax for a certain number of years, unless they are disabled. Women are exempt from both service and the tax. Most extremism investigations in 2017 related to right-wing extremism. The number of investigations into jihadism in the Swiss army dropped for the first time since 2013. Of the 42 investigations, 10 revealed no extremism, 21 revealed right-wing suspects, 8 revealed jihadist suspects, and 3 revealed presumed ethno-nationalist extremists. No suspicion of racial discrimination was uncovered. The army holds a certain attraction among right-wing extremists, a phenomenon well known to the authorities, and something they monitor, said the report. At the same time, no events with the potential to compromise security were reported. 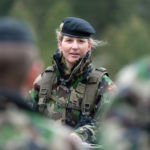 Could foreigners be required to do Swiss military service?